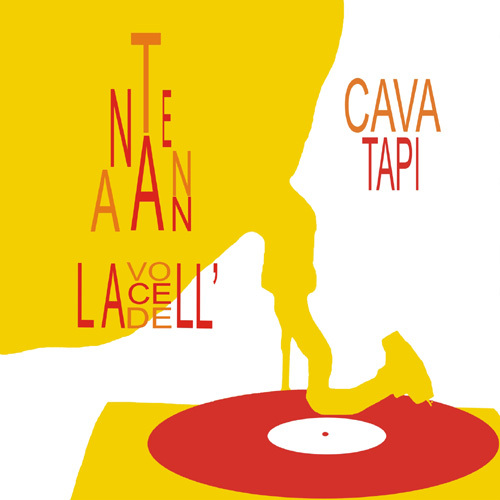 Cava Tapi is the meeting of two musicians belonging to different sides of the music field: Walter Salin’s classical – contemporary side, here as an actor (narrating voice) and guitarist, and Giampaolo Campus’ electroacoustic side, divided between the use of sound objects from everyday life and the use of traditional instruments played through a timbrical research and a playful attitude. In the live set Sergio Camedda joins the two searching on the sampler to emphasize the music expressive possibilities in the digital field, besides taking along an own personal research on sound materials. La voce dell’antenna takes its origin from the performing of some poems written by the Italian Futurist artist, Fortunato Depero, composed in different moments of his artistic career and collected in the following works: Onomalingua (1916), New York (1928-30) and Liriche Radiofoniche (1934). The vocal part is interpreted by Walter Salin who takes the charge to develop the linguistic and music texts nuances, from time to time emphasized by a voice treatment. The music side composed by Giampaolo Campus and Walter Salin aims to show the poet fantastic powerful imagination through a timbrical research based on the use of sound objects, traditional instruments and digital material processing. This work is also thought to describe Depero’s life through interviews of people linked in some way to him, for instance: to Carla Amadori, Rosetta’s niece, the artist wife; to Ivana Gaifas, close friend and artist supporter through the commission of 120 copies of the Libro Imbullonato and, at last, to Marco Zamboni, Ferruccio Zamboni’s nephew, who printed the Libro Imbullonato in his Mercurio Tipography in Rovereto. These contributions are thought as islands which take the listener to a narrative dimension inside the performing of Depero’s poems. This idea is also amplified by the use of field recordings (the sounds of Zamboni’s typographic machines or the flowing of Rovereto river Leno) used to immerse the listener into the places where Depero lived. “La voce dell’antenna” was released on the web as a free download by Parafonica Netlabel (http://parafonicanetlabel.blogspot.it/2012/01/cava-tapi-la-voce-dellantenna-depero-un.html) for the 51st anniversary of the Italian artist’s death, the 29th November 2011. The first stage version took place in Trento, Castello del Buonconsiglio, on the 3rd December 2011. It included, besides the live music, the presence of two screens mixed by Stefano Fadda with the videos of Sergio Camedda and the live performing of Anna Baroldi, who both try to give a personal interpretation of the textual suggestions coming from Depero’s work.